It seems like, contrary to what you have been pushing here, that the live performance part appears to be almost a losing battle. The money isn't being made there. 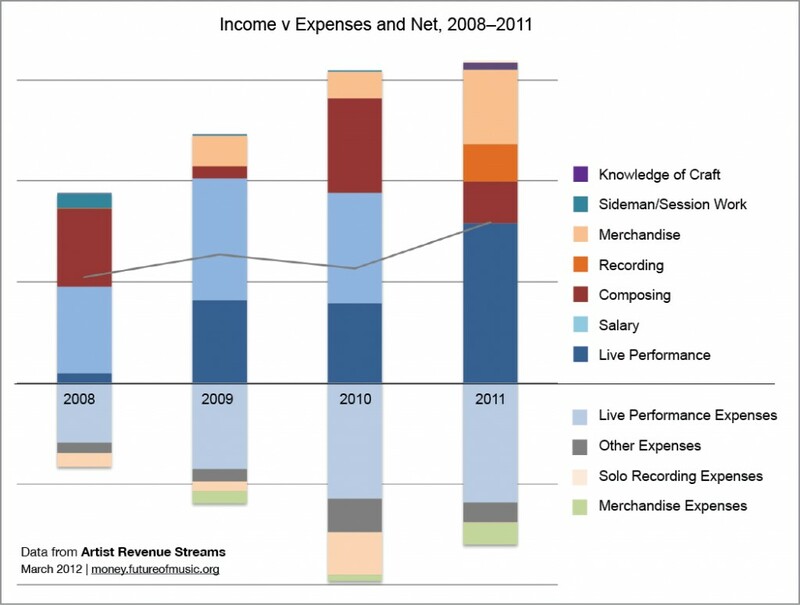 Composing and recording is still very profitable, and really the only bright spot is perhaps merchandise. However, merchandise is one of those areas that is probably the most fickle, and the most likely to be subject to market exhaustion. Basically, we only have so much space for t-shirts, knick-knacks, and take homes from shows. At some point, the market for all of this stuff is likely to go stale, as too many people will be offering too much stuff all of the time. It paints a bit of a gloomy picture really - if the recording side income disappears or shrinks anymore, these artists will find themselves working a grindstone existence on the live side, where the net appears to be very small.